Purple Walrus Press: Matt Patricia: The Lion King or Lyin' King?? By PWP contributor Bob Resch. 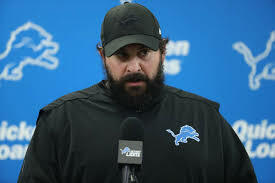 Matt Patricia: The Lion King or Lyin' King?? By PWP contributor Bob Resch. Bob Resch: Purple Walrus Press. occur?? Only she and Matt Patricia know for sure. Patricia's side of the story. We can only hope that for Matt Patricia and his family, let alone Lion Nation, can get past this and move on with their hopes and dreams.